Place the sliced persimmon, pear and rocket into a bowl and toss well. Sprinkle the almonds and pumpkin seeds over the salad. Drizzle salad dressing over the salad and toss. Keep salad in fridge until it is served to ensure the persimmon and pear don’t turn brown. Persimmons are delicious and exotic fruits that are packed with vitamins A, C, E and A. They also include magnesium, copper, zinc and iron. Load up on this winter fruit to help boost immunity over the colder months. 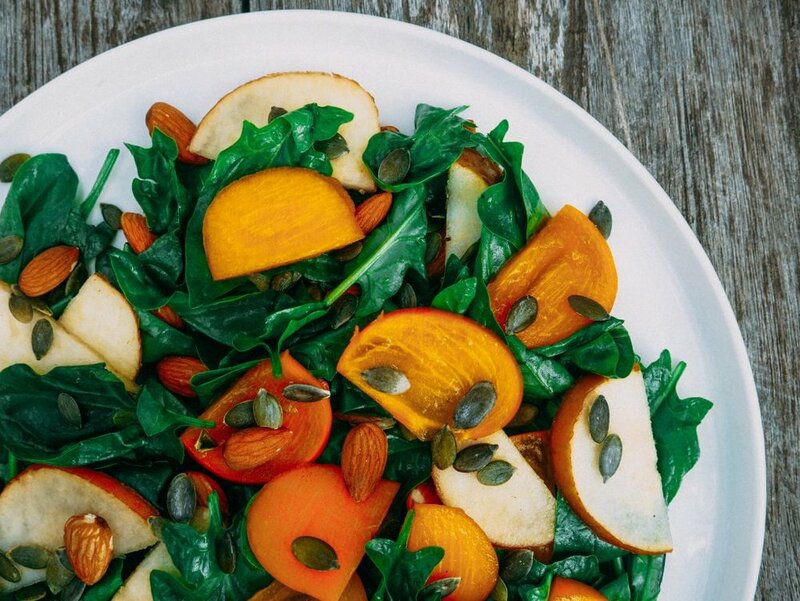 This salad includes rocket, pumpkin seeds and almonds, drizzled in a balsamic and mustard dressing. The persimmon and pear add sweetness, the the rocket adds some bitterness and the pumpkin seeds and almonds add some crunch. This salad is a great side to accompany warming winter meals. For more recipes using Persimmon head to the 5+ A Day website here.